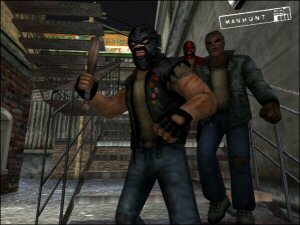 Manhunt is a game that will change the way you look at electronic entertainment, simple as that. Whilst other titles are graphic, violent etc, I am at a loss to figure out a title that will affect players to the degree that this one has for me. You might be thinking at times through this review that I am focusing on the sensational nature of the title, and you know what, I certainly am. 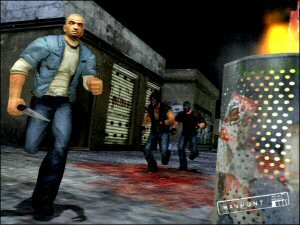 Manhunt is a beautiful savage beast that will rip your throat out if you don't treat it with the respect that it quite rightly deserves. A combination of stealth and direct fighting is the key to this title and you are walked through it to a certain extent. I do recommend getting a Headset before undertaking this game as it will totally change your perceptions about the title and indeed the way you play the game in the first place. 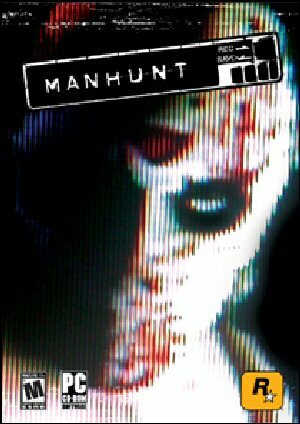 Manhunt utilises the headset in a special way that certainly had me impressed and I am sure that other games will copy this and use it in a similar fashion. If you wear the headset at the start of the game, the game will detect it and send all of Starkweather's communications directly to your ear, making it incredibly creepy. I can recommend getting a headset for this reason alone, it is without a doubt one of the creepiest things I have experienced on a headset yet in a computer game. Add to this the fact that Starkweather is voiced by actor Brian Cox (you will no doubt have seen him play the role of William Stryker in X-Men 2). Speaking of weapons, fans of getting down and dirty with some gunplay might be advised that this will not happen until later in the game. Initially what you will use to kill and kill and kill are the most basic of items like shards of glass, bats, and even plastic bags. It's about halfway through the game that you will get access to all the good stuff in terms of guns and other assault weapons. I think it's partially the reason why you really feel like you are fighting for Cash's life; you have nothing but your wits and the essentials to get you through. There are two forms of attack and murder and they can be done in a number of ways that escalate in violence. Maintaining a hold or move for a short period will result in a light attack whereas the longer you keep your victim in check will do a more violent attack. Holding down the button will see an even more violent event take place. An example of this is a light tap will see Cash suffocate someone will a plastic bag, holding it down and then releasing will see you suffocate your victim and punch him in the face. These gory attacks are played in a brutal easy to see fashion with the insidious voice of Starkweather goading you on in your ear the whole time. 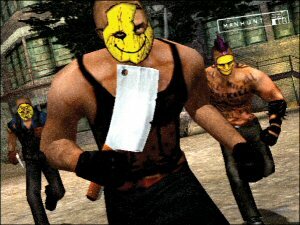 It's the most sadistic incentive to play a game that I have encountered, even more so than Postal or Carmageddon, which don't hold a candle to this title, despite even Postal 2's try hard attempt to shock. Your opposition in the hunters is not to be overlooked either with an uncanny amount of intelligence having been given to your main foe. Not only can they hear you through the microphone and in game noise, they are also possessed of a cunning that will astound, being able to track you through the huge levels if you are not wily enough to give them the slip. Cash can hide in black shadows where hunters cannot see him even if they are right next to him. It suspends the reality of the title, however also provides a much needed way out as well and I think a brilliant addition to the game. As you make your way through the title, the enemies that Cash comes up against will be of greater cunning and your earlier tactics frankly don't work anymore, which is awesome as the game evolves into it's own lumbering murdering beast. I loved this title on PS2 and on the PC, it has retained everything that made it what it is; possibly one of the most full on games that I have played in some time. This ain't no game where you can ping the baddies from a distance. This title is up close, personal and in your face. I love it!